Tracks durations on the sleeve and labels are the same of the cd edition but many tracks are actually longer: the real times are here hand-measured. Is anyone else experiencing that sounds are missing in the vinyl pressing? Like the wonderful chords in Turbo Dreams, they are totally missing which makes this a very dull listening experience. Rotary is one of the best tracks on the album - it's a shame that it's missing on the vinyl pressing! anyone else have a problem with the first 10 seconds of turbo dreams skipping? i purchased new and experienced it from the beginning. of course it was my favorite song from the album. i wonder why they left off three tracks from the vinyl release. this should get a full re-release on vinyl. I've heard a number of all-star collaborations that produced mediocre results. Slag Boom Van Loon should have been a stellar album. Speedy J and u-ziq? What could be better? The results were okay, but fell far below what I had hoped. I was skeptical about this CD when I first bought it. 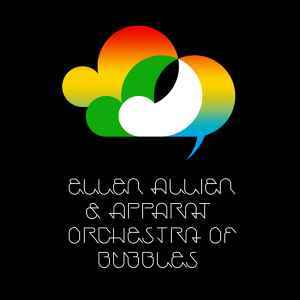 I like Ellen Allien a lot and I've just lately been getting into Apparat. I was very pleasantly surprised with this. It seems to combine the best of both artists into what I hope will be a continuing series of collaborations. It's danceable, maybe a bit more so than Apparat's usual style, but rhythmically interesting. So often the tired four-on-the-floor beats do little to differentiate themselves from all the rest, but here, the foundation is further enhanced by microscopic little touches - it makes all the difference. The main strength is the melodic component of each track. If you've heard Apparat's "Walls" album, you know what to expect: tuneful, if slightly mellow electronic music that is both danceable and listenable. I'm happy that the album isn't totally dominated by Allien's vocals. While her voice is very effective on her own work, it would have given this CD a different and altogether more mundane feel. Instead, the music is mostly instrumental allowing for different song structures. While I say that the melodic content is impressive, that doesn't mean there's a shortage of interesting sounds. Quite the contrary. It's just that the sounds are themselves melodic, rather than rhythmic. When listening to, say, Richard Devine, I'm constantly aware of the amazing sounds he's getting out of his computer, but they are textural rather than melodic. Orchestra of Bubbles clearly falls in the latter category. If you're a fan of Ellen Allien or Apparat, this is a no-brainer. Buy this immediately. I'd also recommend this to fans of forward-thinking electronic and dance music. It's definitely one of the more unique albums to come out this year.